I really wish I knew how to knit or sew. When I was in high school I bought a bunch of patterns and made cotton, summer dresses for myself. I did a decent job with the clothes that didn’t require buttons or zippers, but the second something more complicated came along in the design my confidence went right out the window. I received a bunch of adorable knit items for my baby shower including the most adorable hat you could EVER imagine. I’m so happy the little one is due to arrive in late October, because he or she will be wearing that cap the second the weather turns cold. I’m heading to a baby shower for a friend this weekend and I really wanted to bring something semi-homemade. Since I don’t knit or sew I decided to create a do-it-yourself diaper cake. When my husband saw me bundling up tiny little diapers he thought I was a little bit crazy, but I have to say I think the cake turned out pretty adorable. I added little trinkets like pacifiers, bath soap, shampoo and baby lotion all throughout the cake and topped it off with the most adorable little stuffed dog that barks when you squeeze him. Who can resist that blue gingham bow? I bought a few other small gifts for the shower as well, but I like how this gift turned an otherwise basic box of diapers into something shower-worthy. If you’re able to purchase diapers at bargain prices you can really stretch your dollars. A package of diapers this size typically costs around $15, but if you play the drugstore game I bet you could buy a pack for less than $5. If you’re able to buy other baby supplies at bargain prices you can add them to the cake. If not you can always find relatively inexpensive items like toys, bibs and baby socks at places like TJ Maxx and Marshalls. I found a couple of adorable socks and rattles for just a few dollars. While you’re at it don’t forget to use your rewards credit card to accumulate extra cash or miles. My husband and I use the Chase Freedom card, but good friends who travel extensively recommend the American express air miles card. I made a diaper cake for a friend’s shower years ago, but I refreshed my memory by watching an Internet video on the subject. It’s unbelievably inexpensive and easy to do! We have done diaper cakes for a few of our baby showers. They are so well received. Your pic looks great. Thanks @Jolie & @Ruby Leigh. It was a big hit! 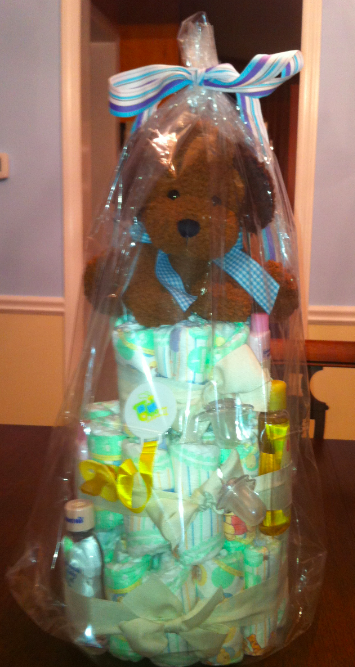 Diaper cakes are a great gift and baby shower decor. I'm hosting a shower this November and diaper cakes will be used for our center piece.